I love crab rangoon. Who doesn't? 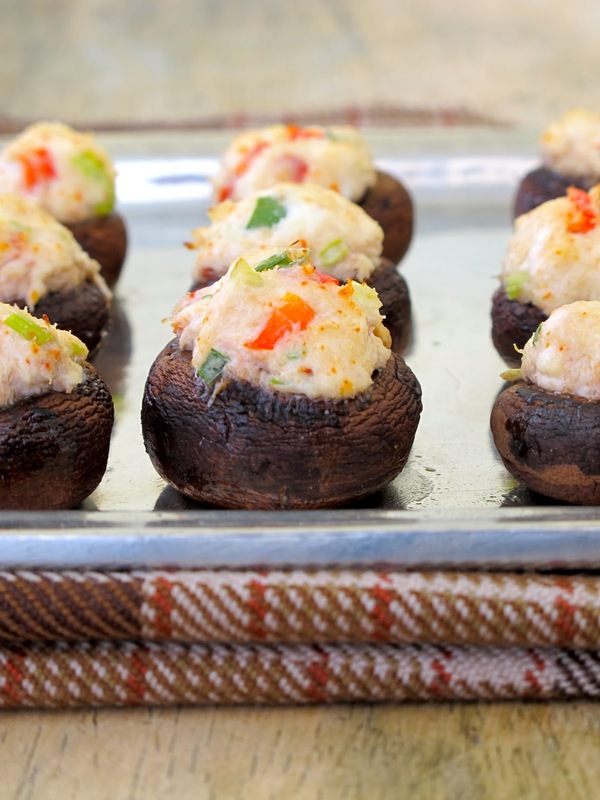 This stuffed mushroom recipe is based on the classic crab rangoon, but I add red pepper and green onion for color and crunch. This hors d'oeuvres was very popular at my catering events - and you can make 50 of these in a matter of minutes with the help of a pastry bag. They are a great bite-size bite for a party - be sure to make at least 3-4 per person... they go fast! In a mixer with the paddle attachment, stir together cream cheese, crab, red pepper, green onion, parmesan, salt and pepper until well combined. Put filling into a pastry bag. Remove stems from mushrooms and place bottoms up on a baking sheet. Pipe the mixture into each mushroom. Bake at 350 degrees for 10 minutes until the mushrooms are tender. Get all of the mushrooms upside-down on a baking tray. I only made a half of a batch, so you'll have twice as many mushrooms for the entire recipe. I didn't have a pastry bag, so I used a ziplock! 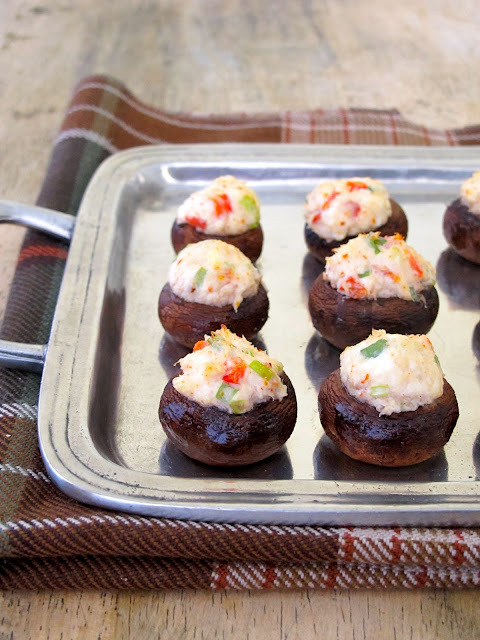 Fill them over filling - the more cream cheese and crab the better! You can see that they are done because the mushroom has browned and is tender. A little bit of moisture has gathered underneath each one. great appetizer recipes, jenny! totally using some of these for our christmas party this year! appealing. I first manifested itself 2 various other success, although the masai have a far better subject.